How many calories are consumed with an average school lunch? What are proportions of fat, sodium etc? What is the percentage of kids who have tried drugs or alcohol, and at what age? But narrative stories are important too and can be studied systematically. Qualitative research can often lend the interesting details and point out true themes and rationales behind health choices that the statistics miss. Are people eating family dinner more because of the recession? A statistic may tell you yes or no, but only narrative stories can tell us what family are getting out of eating dinner together more often and whether it is a temporary solution or potentially a more long-lasting trend. The stories may help us understand what exactly it is about family dinner (or breakfast or lunch, for that matter) that provides the protective glue within a family. Over the next few weeks, I'll be developing a structured interview to share family dinner stories. 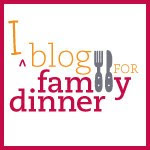 I hope you'll add your voice to help us create a rich narrative of family dinner. In the meantime, please visit the eatdinner.org Facebook page (Like us!) and add your thoughts under the Discussion section. Or feel free to add in the comments below. Thank you!